As building technology has evolved, one of the standout developments has been structural insulated panels, or SIPs. SIPs allow for the creation of solid, sturdy, energy-efficient houses. Open vaulted ceilings, big soaring roof lines and no need for a truss system are all possible with SIP panels as well; with such reliable structural strength and durability, there’s the opportunity for more design creativity in homes than never before. Many architects believe that SIPs are superior to conventional framing systems in just about every way. They are better insulated, sturdier and faster to build with than with the standard stick-frame method of construction. SIPs also help to conserve natural resources since they produce so little waste. SIPs are made of rigid foam insulation that is sandwiched between two skins of strand board with a high-strength adhesive. The core is usually expanded polystyrene (a la those styrofoam ice chests or packing peanuts used in shipping) which acts both as a spacer and insulator. The exterior skins of the panels are made of a rigid material such as plywood, metal or oriented strand board. While stick-frame construction uses lots of 2 x 4s with hundreds of individual nailed connections needed to hold studs and skins together, with SIPs, each panel acts as a self-contained component. Because of this, SIP homes have twice the strength and durability of a wood-framed home. This can be especially advantageous in areas like Kansas and other midwest states that are prone to tornadoes, heavy storms and gale-force winds. 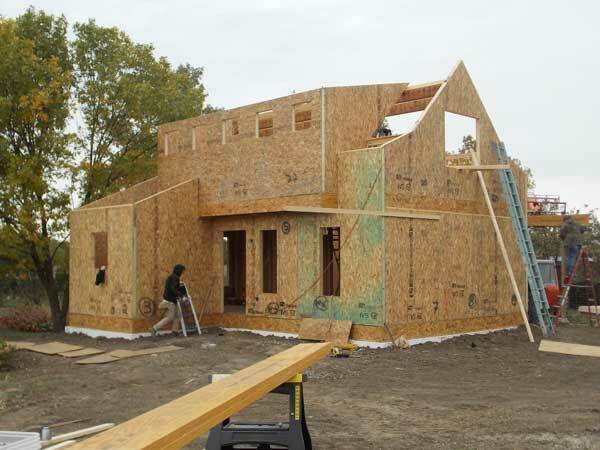 Builders and home buyers in Northeast Kansas including Lawrence, Topeka, Baldwin City, Tonganoxie and Ottawa are waking up to the benefits of SIPs. SIP construction is easier than stick framing if done correctly. SIP structures tend to be built straighter, smoother and truer; this makes installing siding, sheet rock, doors and windows much easier while also yielding superior results. SIPs come in either 48 or 96 inch panels and are up to 24 feet long. Panel drawings delineate roof and wall planes, and both the architect and contractor sign off on these drawings before the panels are ordered. Panels are then fabricated, cut and prepared at the manufacturing plant. Once the panels are created, erection and installation can begin. The process is not difficult; once the floor is complete, panels are placed for the shell stage after a sill plate is attached to a slab with anchor bolts. Door and window openings are cut into panels before installation. Each panel slips over the sill plate and into the previously set panel. A bead of adhesive and a couple of screws are used to adhere each joined surface. Wall braces align and stabilize the walls until corner connections and the top plate are installed. SIPs require a one-eighth inch joint tolerance to allow for expansion and contraction between panels. Once all wall panels are up, the continuous top plate is caulked and inserted to true and stabilize the wall. A nail gun is then used at each joint to finish installation. Due to their insular care, it’s no surprise that SIPs are also very energy efficient. A structure made of SIPs uses only half the energy that a stick-frame house does for both heating and cooling. Both the thickness and “tightness” of the panel offers superior resistance to heat flow, resulting in exceptional efficiency and indoor comfort. While the cost of using SIPs can add 5 to 15% to the total cost of building the home, it is still overall a better value than conventional wooden construction. The savings in energy costs, added structural stability, faster construction times and savings in labor pays for any added costs within two to four years. SIPs are considered a green, eco-friendly product, since using them helps to reduce wood waste. Also, the insulating properties of SIPs result in ongoing energy conservation and savings. While some of the chemicals used in SIPs have been under scrutiny, it is still believed the benefits outweigh the risks. For example, SIPs made of expanded polystyrene include the flame retardant HBCD (hexabromocyclododecane). However, since it is enclosed within the insulation of the panel, very little of it will ever enter the environment. “Outgassing” is not a problem, as polystyrene is a “closed cell” material. Overall, the environmental benefits of SIPs are big. Once the SIPs are manufactured safely and enclosed within the walls and roof of a home, they pose no danger to the inhabitants or the environment. Lower energy bills, reduced jobsite waste and the use of materials made from rapidly renewable resources all contribute. Home owners also experience better indoor temperature control and air quality, and there are environmental certifications and tax credits available for both builder and homeowner. More and more construction industry professionals are coming to believe that construction should be sustainable, eco-friendly and non-resource depleting. This interest in sustainability continues to draw attention to SIPs. The structural insulated panel can go a long way toward saving resources and energy in a cost-effective way. Perhaps someday styrofoam will be made of organic products and strand board of sustainably harvested wood or other natural items, increasing their “green” appeal even more. Regardless, as worldwide timber availability declines and labor costs increase, SIP construction offers an excellent solution.